I've known Miss Oops throughout the years for their Rescue Sponge, which has always worked so well at removing makeup and deodorant stains. So I was excited to hear that they have just launched some new problem-solving skincare products! Plump Up The Volume ($45) is a collagen-boosting serum that plumps up your cheeks. It's formulated with sea kelp, pomegranate extract, natural active peptides and horse chestnut extract. This multi-tasking serum also combats crow's feet around the eyes, and works its magic around the lips, smoothing out fine lines and wrinkles. Reign in Rosacea ($45) features Epidermal Growth Factor, which is proven to be highly effective in controlling Rosacea breakouts. This powerful serum is comprised of 100% active ingredients such as aloe polysaccharides, green tea extract, natural active peptides, sea kelp and pomegranate extract. 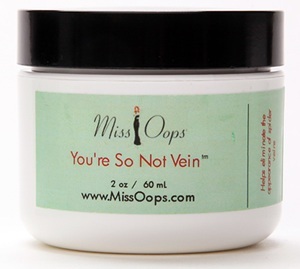 With shorts and swimsuit season coming up, I can't wait to try You're Not So Vein ($82), which helps reduce the appearance of spider veins, while promoting healthy circulation. Ingredients include licorice, grape seed and rose hip oil. This smoothing cream is dark-brown in color, but blends in and works for all skin tones. 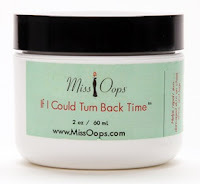 If I Could Turn Back Time ($82) takes care of skincare problems due to sun exposure. This repair cream is developed with sandalwood essential oil, resveratrol, jojoba and rosehip seed oils, shea butter, avocado and sweet almond seed oil. The cream softens and hydrates skin, working on undoing the sun's drying effects. These new skincare products are available at missoops.com.